Okja looks for all the world like a heartwarming family film about a little girl’s friendship with an adorable giant pig and that’s exactly what it is… for about twenty minutes. Director Bong Joon-ho (The Host, Snowpiercer) uses this time to lay the pipework of the plot. The multinational Mirando corporation has sent out 26 ‘superpigs’ to be raised by farmers around the world., After ten years, the healthiest and biggest pig will win a prize. We get to know 14-year-old Korean girl Mija (An Seo Hyun), who has grown up alongside her grandfather’s superpig, Okja, on his farm in rural South Korea. With The Host (2006) Bong showed a gift for making CGI creatures feel real but Okja is of a different order to that film’s barely-glimpsed monster. A lumbering, lovable lummox that resembles a hippopotamus playing puppy, Okja gets a lot of screen time and rarely feels anything less that a real, physical animal. The opening few minutes deftly sketch out the superpig’s relationship with her best friend, Mija and shows both mutual adoration and glimmers of real intelligence behind Okja’s piggy eyes. Everything changes for Mija when the ten years are up and Mirando, headed by Tilda Swinton in a dual role as twin CEOs Lucy and Nancy Mirando, recall ‘best superpig’ Okja to receive her prize. The competition was, of course, a PR sham meant to distract the public from Mirando’s dabbling in GMO meat production and Okja will suffer the same trip to the slaughterhouse as her equally delicious relatives. Mija sets out to rescue her friend, only to run across a cell of the Animal Liberation Front headed by a calm and serious Paul Dano (Little Miss Sunshine, There Will Be Blood) who want to use Okja to infiltrate Mirando’s secret GMO labs. The ensuing adventure is a lot more downbeat and harrowing than the jaunty trailer might suggest and Bong does not flinch from showing the reality of industrialised meat production. It doesn’t all work. Jake Gyllenhall’s washed-up nature show presenter (a blend of Steve Irwin and a crazed Johnny Morris) looks like he is being set up to have a crisis of conscience but his plotline never really takes off and Gyllenhall’s performance at times seems like he is trying to offset all the CGI ham with a hock of the real thing. Swinton’s dual roles, while both well done, seem more at home in a Terry Gilliam film or Bong’s previous Snowpiercer when compared to the more naturalistic performances around her. Those quibbles aside, Okja is a thought provoking and very watchable piece of science fiction that genuinely has something to say about capitalism and the lies we tell ourselves about where our food comes from. 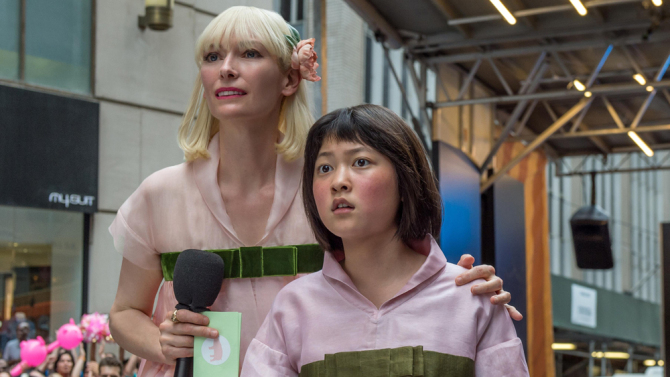 Okja may not convert all its viewers to vegetarianism, but it would be interesting to see the half-finished hotdog stats from its brief cinema run.